These 2mm pitch plugs and sockets are ideal for use in limited spaces. 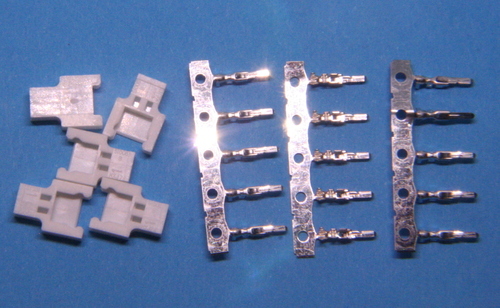 The 2 pin versions provide a very small but safe method of connecting and disconnecting LiPo and the 3, 4 and 5 pin versions can be used for balance connections where a JST-XH would take up too much space. A plug is a male plastic shell with female crimp terminals and a socket is a female plastic shell with male crimp terminals. Many single and 2S LiPo come fitted with a 2 pin plug. Unfortunately, there is no manufacturer consistency in the way that the negative and positive wires are inserted into the shell. The Micron convention is that negative is at position 1, as shown in the image of a socket at the right. All leads and LiPo supplied by Micron are wired this way - see Connector Wiring for details; please contact us if you need your LiPo or Molex 2mm leads wired with pin 1 positive. A 5 pack of Molex 2mm pitch plug shells and crimp terminals (each packet contains 5 spare crimps for you to practice). A 5 pack of Molex 2mm pitch socket shells and crimp terminals (each packet contains 5 spare crimps for you to practice). A 100mm lead with 2 pin Molex 2mm pitch plug at one end and bare wires at the other end. The wire is 0.15mm sq and good for 4A. A 100mm lead with 2 pin Molex 2mm pitch socket at one end and bare wires at the other end. The wire is 0.15mm sq and good for 4A. A 2 pin Molex plug fixed into a 20x10mm mounting plate and with 100mm red/black leads plus a mating 2 pin socket with 100mm leads. The wire is 0.1mm sq and good for 2A. All of these adapters use the Micron wiring convention (pin 1 is negative). Please contact us if you need an adapter lead with pin 1 connected to positive. 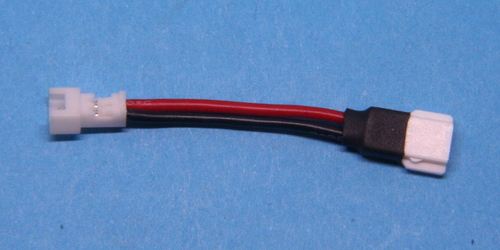 An adapter lead to allow single cell LiPo with 'UM' battery connector to be used with receivers or ESC that have a Molex 2mm 2 pin socket. The Molex plug is wired with the Micron convention of pin 1 negative. 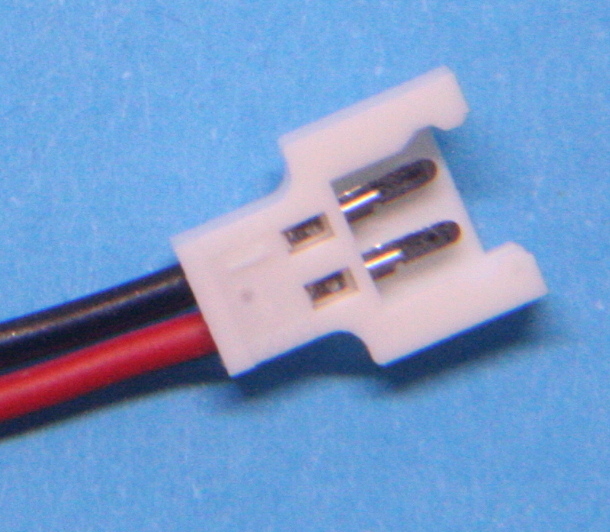 An adapter lead to allow single cell LiPo with a 2 pin Molex 2mm battery connector to be used on receivers with a 'UM' socket (e.g. the Spektrum AR6410), or to allow the LiPo to be charged with a 'UM' charger. The Molex socket is wired with the Micron convention of pin 1 negative. A 250mm 1S charge lead with a 2 pin Molex 2mm pitch socket at one end and a red/black 4mm plugs at the other end for connection to a chargers's positive/negative sockets. For use with 1S switch plates. A 250mm charge/balance adapter lead with a Molex 2mm pitch plug at one end and a JST-XH plug at the other end plus 200mm red/black bare end wires for connection to a charger's positive/negative sockets. The red/black wires may be snipped off if your charger uses only the JST-XH connector for charging and balancing. If your charger does require connection to the charge sockets, suitable 4mm plugs are available. The adapter is designed for charge currents up to 2A. 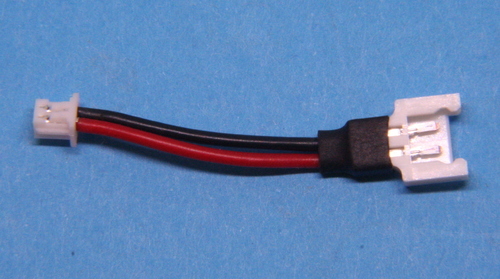 The Molex 2mm connector is used for LiPo charging and balancing where space is tight and there would be insufficient space for a JST-XH. 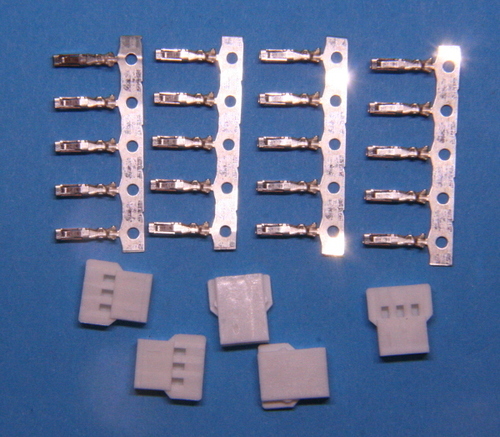 These connectors are used on the Model Rail Wiring Harnesses. 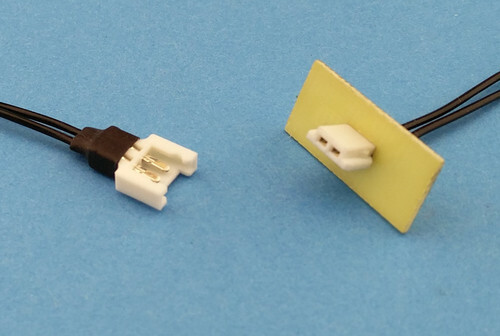 These switch/charge modules provide a simple way to implement an on/off switch and charge connector on your model vehicle. They comprise a small GRP plate containing a slide or toggle switch plus a Molex 2mm pitch plug (male plastic shell, female metal parts) and an LED which may be used to monitor the receiver status. The GRP plate is supplied without any mounting holes as it may be either glued into place or holes made and fixed with small (e.g. M2) screws. The switch modules may be used for any battery type. Lithium batteries (LiPo or LiIon) require one more charge wire than the number of cells so you must select the correct 'S' count for your battery. NiMH batteries need only a 2 wire charge connector so select 1S for these. A tiny on/off slide switch and charge socket module for model vehicle installation, comprising micro slide switch 2mm pin space Molex charge connector and 1.8mm LED mounted on a 20mm x 10mm GRP plate. The JST-RCY connector is only appropriate for the 1S switch. The other connectors will have cell count + 1 pins. A small on/off switch and charge socket module for model vehicle installation. The module comprises a miniature slide switch, 2mm pin space Molex charge connector and 1.8mm LED mounted on a 25mm x 15mm GRP plate. 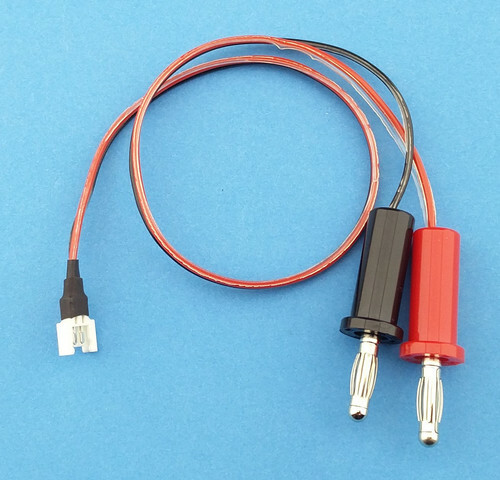 The wiring comprises 50mm battery leads with various connector options, 100mm red/black/brown output/LED wires with bare ends for soldering onto your receiver pos/neg/LED2 pads or splicing onto the receiver lead-out wires. The LED positive wire (brown) has a series resistor for use on 3.3V (Deltang Rx 'P' output). A small on/off switch and charge socket module for model vehicle installation. The 1S module is suitable for a single LiPo/LiIon cell or a multi-cell NiMH battery. The 2S, 3S and 4S modules are for multi-cell LiPo/LiIon batteries which require all cells to be connected to an external balancing charger. The module comprises a miniature toggle switch, 2mm pin space Molex charge connector and 1.8mm LED mounted on a 25mm x 15mm GRP plate.